In Wisconsin, you can buy a car from a private seller or a dealer. When you buy the car from a dealer, they will handle the required paperwork on your behalf. But when you buy it from a private seller, you will need to handle the required paperwork yourself. So, you need the required paperwork from the seller in order to get the car registered and titled with the Wisconsin Division of Motor Vehicles (DMV). Continue reading this article to get more information about the paperwork required when buying a car in Wisconsin. A Bill of Sale: This is a document that shows both your name and that of the seller, the purchase price, vehicle make, model and year. The Certificate of Title: This document must be signed correctly by the place and include correct vehicle odometer reading. If the title has lien on it and it is not stamped with a “paid” tag by the lending company, don’t purchase the vehicle until the release is proven. In some cases, the loan may be paid off but the title fails to show this. In this incident, ask the seller to obtain a signed letter from the lending company detailing information about the loan clearance and the vehicle details. Without this letter, you will not be permitted to register or title the vehicle. You cannot legally purchase a vehicle without a title. If the title is missing, the seller must apply for a duplicate copy before selling the car. So, the seller must fill and complete Form MV1 (Title/License Plate Application Form) and pay a title replacement of $69.50 to get a duplicate title. The seller can then transfer the title to you. 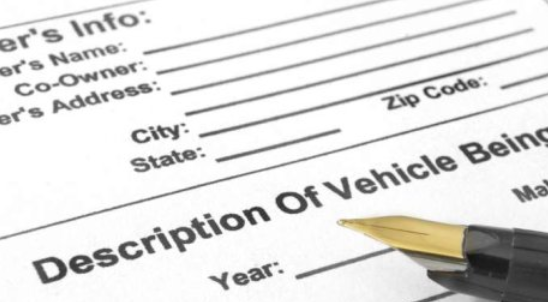 You don’t have to present vehicle registration papers in order to title or register your newly purchased vehicle. You can obtain either permanent or temporary vehicle license plates from the Department of Motor Vehicle office within 2 days from the date of vehicle purchase. You can apply for a new license plate or transfer them from your old car. Fees for new plates, temporary tags and transfers vary depending on vehicle size, weight, location and other factors. By using a vehicle history report, you can confirm what the seller is saying about their vehicle.